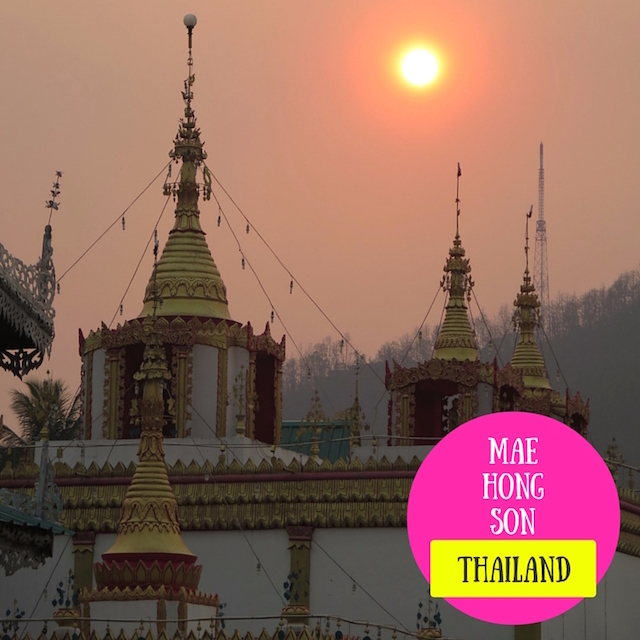 Mae Hong Son was our last destination on the recent road trip to the north of Thailand. 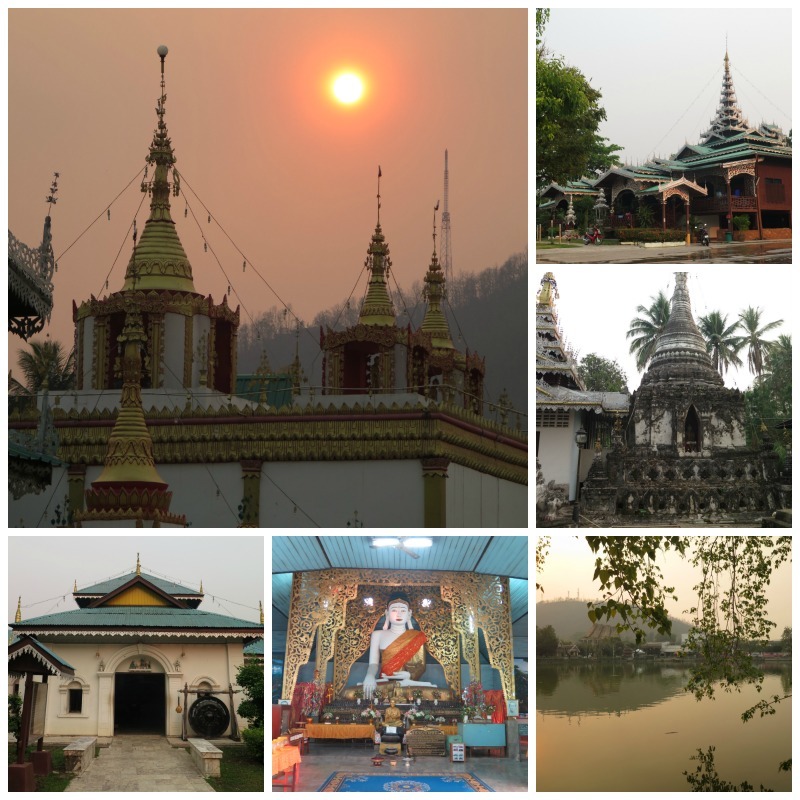 We started the trip in Chiang Mai and drove west to Mae Sarieng, then after a couple days in Mae Sarieng, we drove north to the ‘Muang’ district or the municipality of the province. The distance? Just 164 km. But again, you will want to check the terrain (using satellite) of the map because this is not the usual 164 km drive. But the one through, around, up and down another series of mountain ranges. The easy parts are at the beginning of the route, and then hold on tight when you pass Khun Yuam district, for after this, switch-backs after switch-backs and after more switch-backs all the way into the town. The highway is paved with shoulders on both sides. But then, it is two-way the whole time, and there were slow-moving trucks uphills, fast-moving pickups and everything in between. So, I’d day pay extra attentions. Lucky that we made a brief stop at PTT gas station in Khun Yuam where we met the above gregarious dog who stationed at the front door of 7/11. It was always good to stop and go again instead of driving all the way at one go. Just so you wouldn’t get too tired ahead. The trip took roughly 3-4 hours. Yes, for that 164 kilometres. 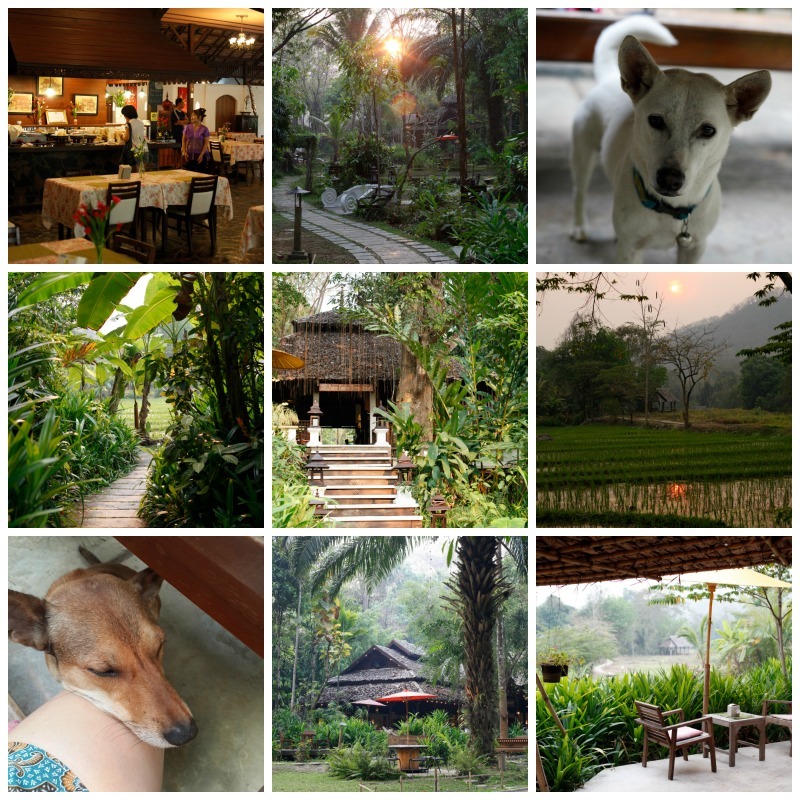 Fern Resort near Mae Hong Son town is a lush, dog-friendly place. The two here are just among many, and most social to the guests. The brown one on the lower left just decided to rest his head on my lap while I was eating breakfast. And he avoided the eye contact, allowing telepathy to work that he – while not being upfront or anything – wishes to share some bites. The white one on right top is our favourite. Named ‘Snow’ after her hair, she was left behind by guests and now happily living and escorting guests at the resort. We checked into Fern Resort that is about 9km away from the town centre. When we were searching for a place, this resort stuck out as the one with a lot of nature. 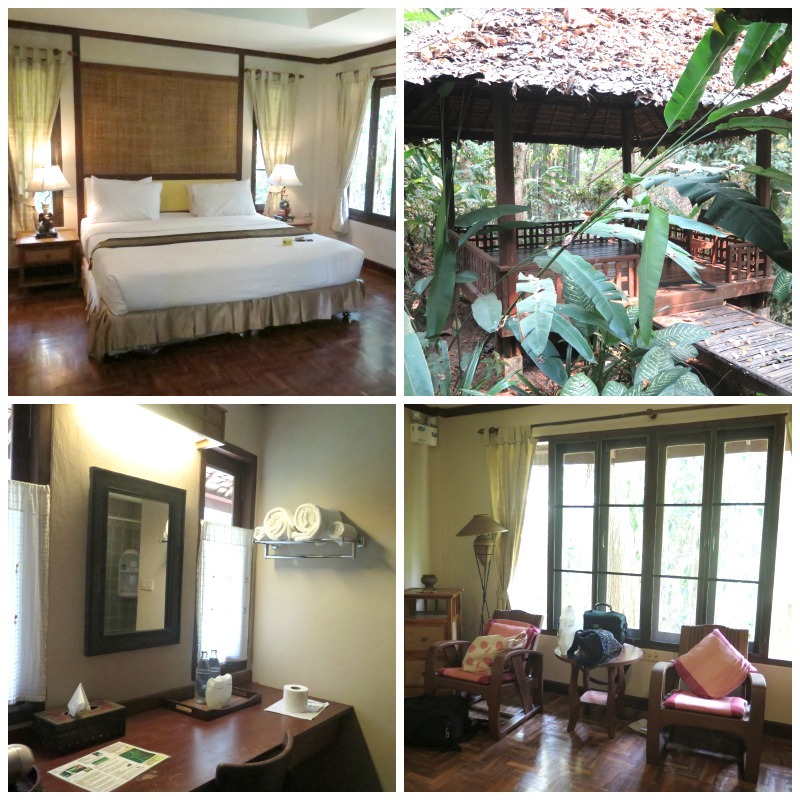 With views of rice paddies and big trees. So, we chose this place instead of some in-town hotels. Tucked in a valley surrounded by what supposed to be a thick forest, Fern Resort’s rooms are secluded and amidst the nature. Our room was a suite with walk-through dressing area and bathroom. And an outdoor cabana. My cell phone (on Dtac grid) had zero signals inside the resort. But there’s a good WiFi at the reception area and the restaurant (where our room was close), so we managed to get a faint signal in our room. I liked quite a few things at Fern Resort: the room was big and clean. Wooden floor and separate (with doors) areas for dressing and bathroom. Also, the staff was funny: chatty and dog-loving. They even defended for the dogs that were wrongly accused of asking for food. Apparently, this place is known for harbouring stray dogs. Some of the perished friends had poems composed for them on their headstones. Also, the food served was decent in tastes and prices. Being quite away from the town, we ate there quite a lot. And the meals were all nice. Also highlights are their lush wild garden and rice paddies. 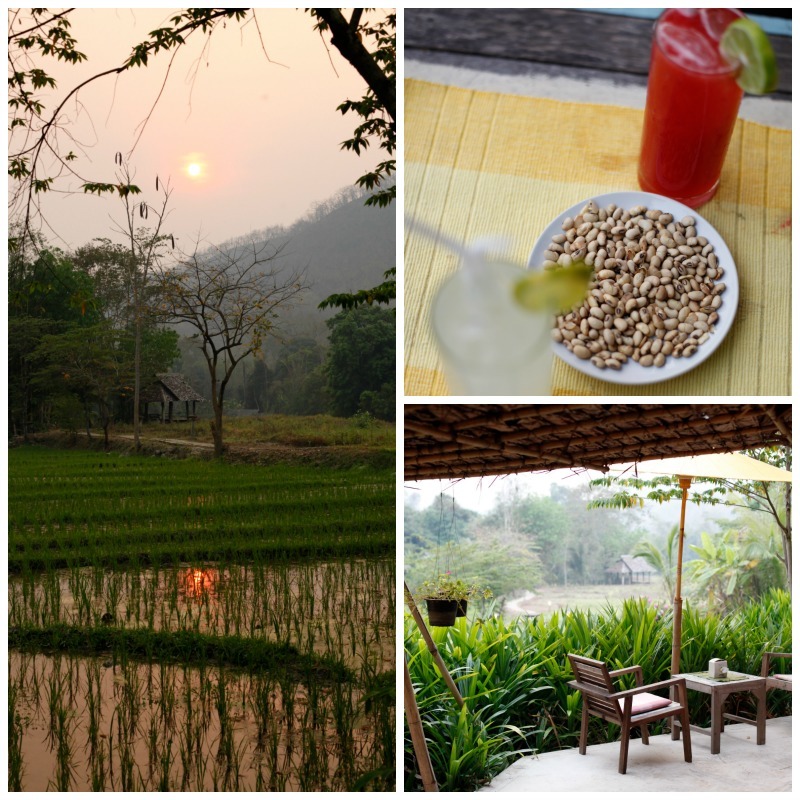 You might want to check out their happy hour drinks in the evening to enjoy the sun-set at the rice paddy bar, too. The drinks are minimal in choice (say stick to the classic cocktails, beers and house wines), and they served toasted soy nuts with the drinks, which I found quite nice. The suite during the low season was about Bt1,600/night including breakfast. I got this deal from booking.com. 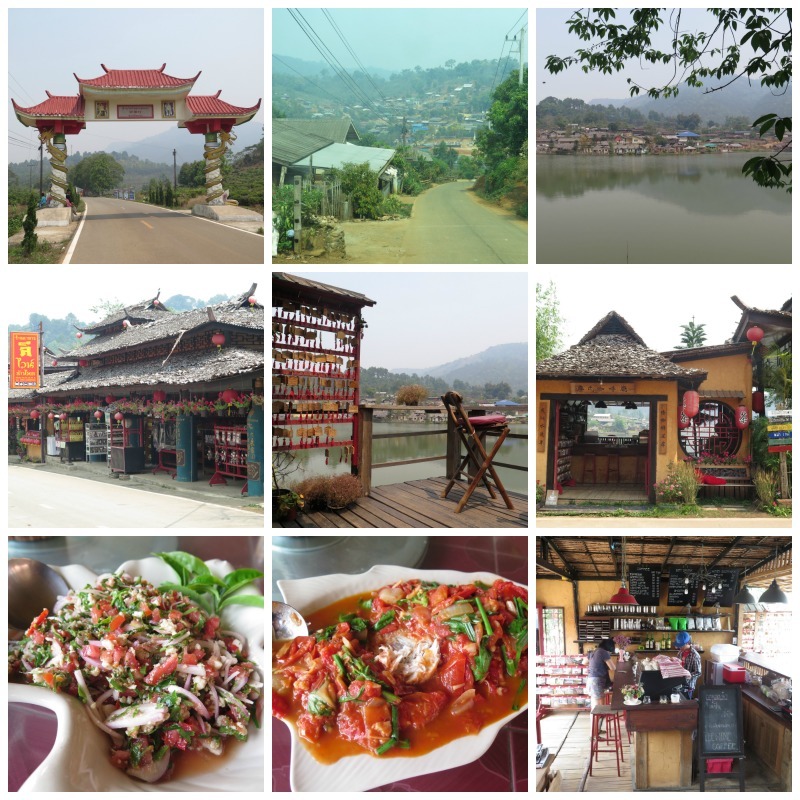 With a small area of just 6 square kilometres, Mae Hong Son’s town is situated in a valley. Practically surrounded by high mountain ranges, the town’s airport is known to be among the toughest to land. Oftentimes, the flight was shut down due to bad weathers. But then, the surrounding mountains also protect Mae Hong Son from over development and influx of tourists that can easily ruin the originality and beauty of the town. 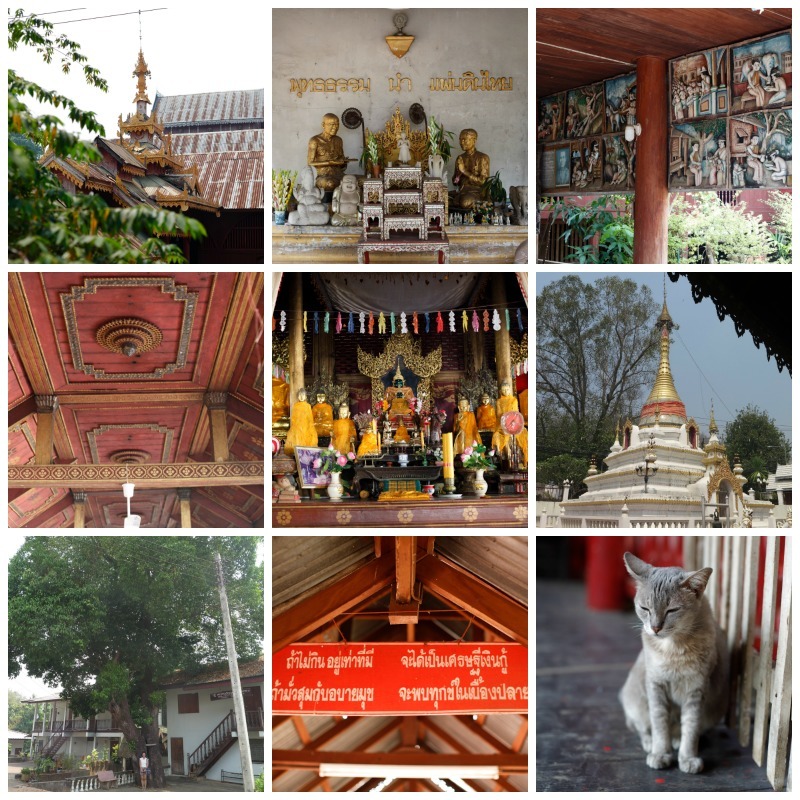 For such a tiny town, Mae Hong Son is packed with beautiful and historical temples. As I have mentioned earlier in the post on Mae Sarieng, temples in this area of Thailand carry a strong trait of particular architecture. A Burmese-inspired one that is called ‘Tai’ culture. Tai Yai is a tribal people whose roots are in these regions: Thailand’s northwest and Burma. So, temples here are distinct with the tiaras of carved and perforated roofings and trimmings. These elements make the temples of this part of Thailand very unique. 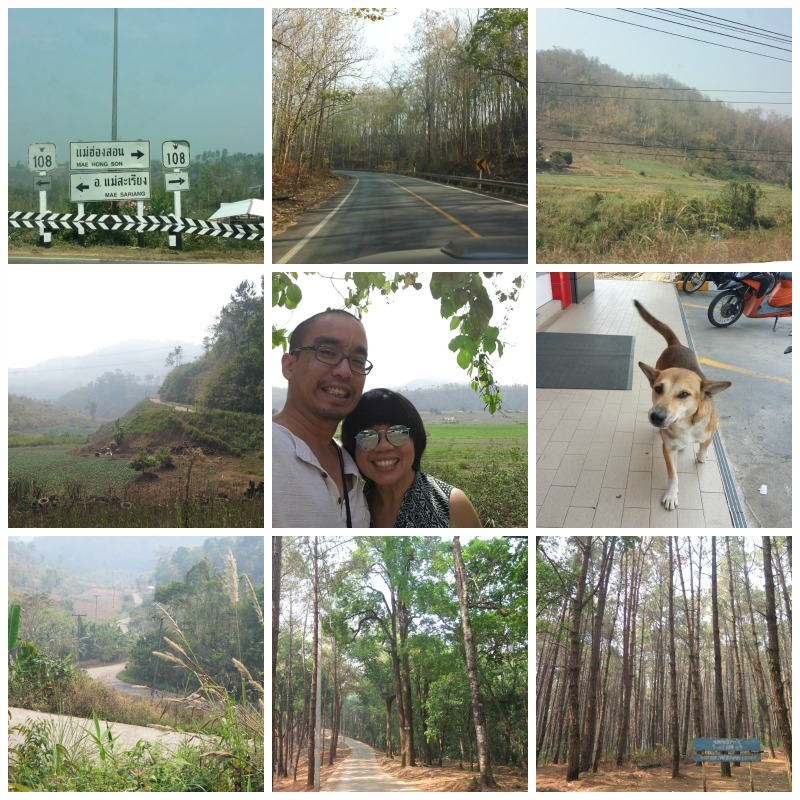 We started our sightseeing at Mae Hong Son’s main road of ‘Singhanatbumrung’ (ถนนสิงหนาทบำรุง). 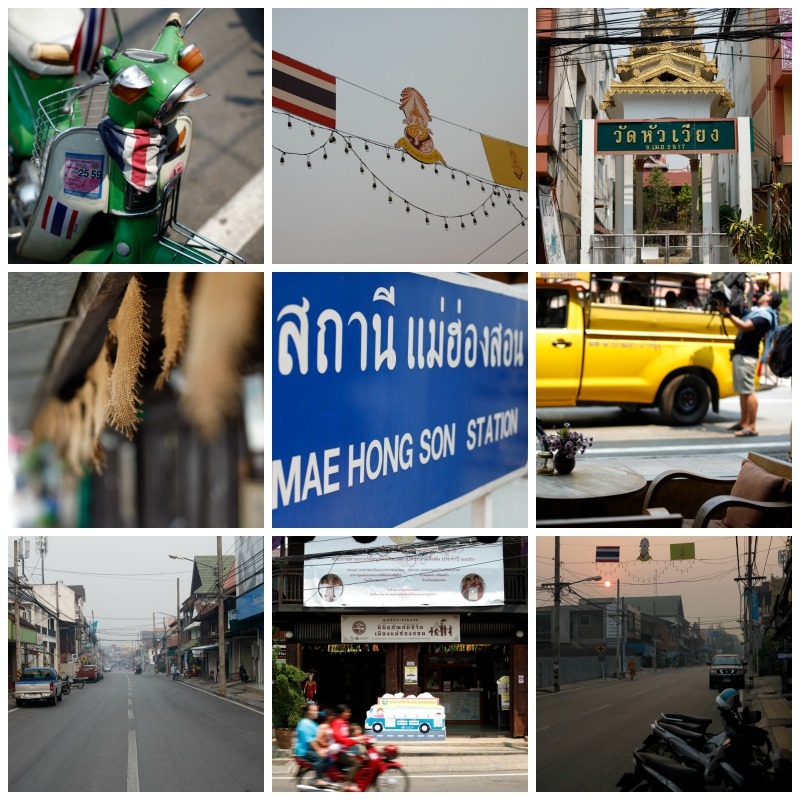 This area is packed with all must-sees: historical buildings and houses (ตึกอนุรักษ์) that have been so well-preserved, the living museum (พิพิธภัณฑ์มีชีวิตแม่ฮ่องสอน) that we found so so lovely and informative, the fresh morning market (ตลาดสายหยุด) as well as some good places to eat and chill. Below is also the details of each places. Wat Jong Kham + Wat Jong Klang are a twin of two temples inside one property. They are located just across the Jong Kham pond or lake (หนองจองคำ) where in high seasons will be the area for evening market. 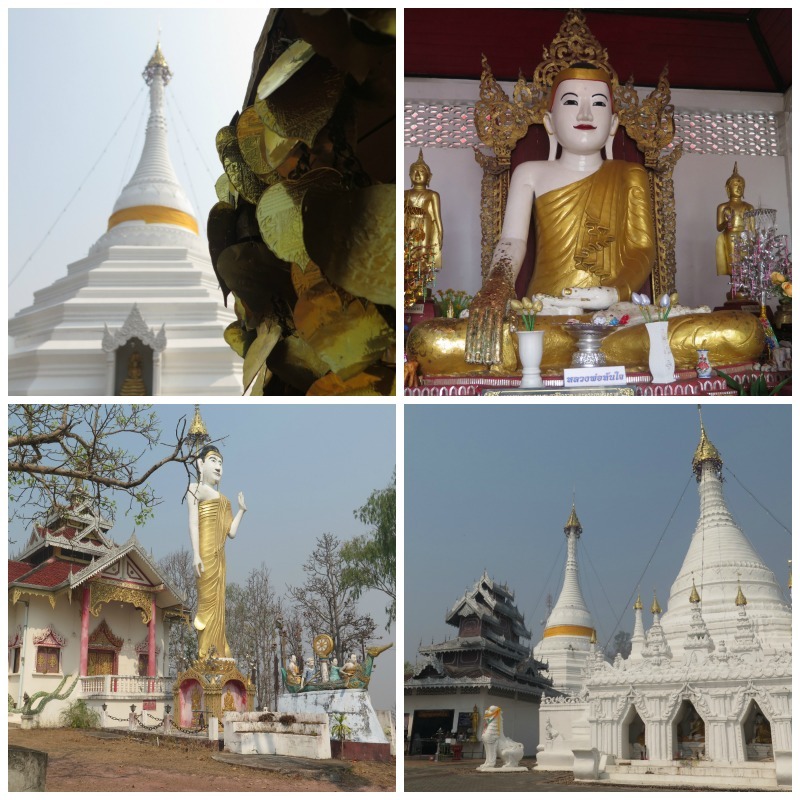 Apart from the exterior architecture that I have mentioned, the Buddha statues of the temples in Mae Hong Son also look Myanmese, with red lips, plain white body, and thick brows. Perching up on the hill northwest of the city, Phra That Doi Kong Mu is the town’s highlight and perhaps most revered and visited. We should have seen the whole town that morning when we were up there, but thanks to the smoke, we only saw grey clouds. The temple is a big place with coffee shops, restaurants and souvenir shops near the parking space. You might also want to walk up to another shrine up the hill (the lower left picture in the above collection of four). This is obviously a place where people come to make a wish. The thing to do is writing your names or your loved on on a golden bodhi leave and hang it on the tree at the temple for good luck. 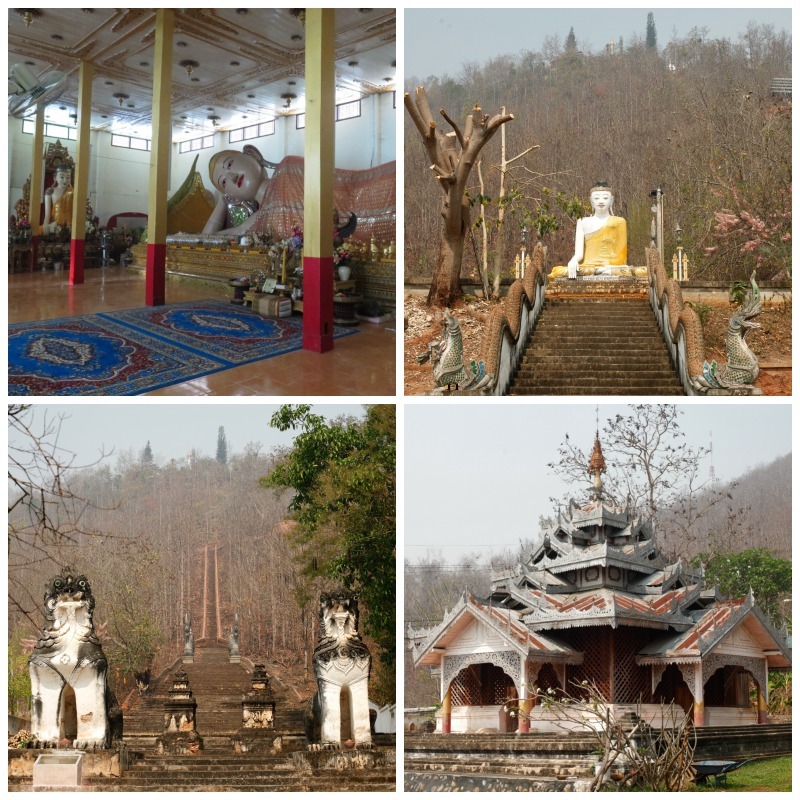 Just down the hill from Phra That Doi Kong Mu is Wat Phra Non – another historical temple of MHS. You will see the two giant lions guarding the temple with a long outdoor staircase leading up to Wat Phra That Doi Kong Mu. These lions are Mae Hong Son’s main charms. Both Wat Phra Non and Wat Phra That Doi Kong Mu were built back in the day of the town’s first ruler ‘Phraya Singhanatracha’ พระยาสิงหนาทราชา back in around 1860s and the lions were there since then, guarding the stairs to the town’s most important temple and overlooking the town below. Phra Non is what we call Buddha statue in a reclining position or Pang Sai Yat ปางไสยาสน์. The reclining buddha at this temple also carries a face like a Burmese (or Tai Yai) buddha, stretching 12 metres inside the ubosoth. The highlight of this temple, though, is also its ‘museum’ that exhibits personal collections of Mae Hong Son’s past luminaries. From rare stamps to cameras and old memorabilia such as old pictures of HM the King and the whole royal families, this place carries also life’s one big motto: you can’t take anything when you die, just your name. So leave it for others to see, and let it go. Opposite to Wat Phra Non is the small and very charming Wat Kam Kor (วัดกำก๋อ) – another old and very charming temple. The highlight is the all-wooden ubosoth, old carved panels and roofing as well as the serenity, giant trees and the small shrine for King Rama V all decked out in local wood carving panels. 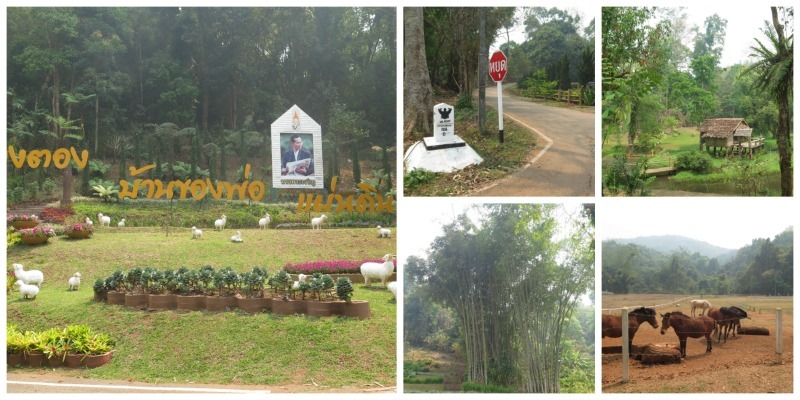 For such a small town, Mae Hong Son has an excellent living museum. In fact, when I look into it, the whole town itself is the museum. Not just this one building. Set in an old preserved house, the museum exhibits the roots of Mae Hong Son in various displays – all with attractive drawings and designs. This is a good start for those coming in blank and want to learn about the place where they’re starting the sightseeing. 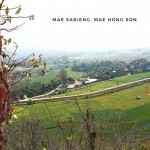 Being surrounded by the mountains, says the exhibit, makes Mae Hong Son a secluded place. Hard to come over, this place is naturally protected by the influx of tourists and over development, hence the preservation of old cultures and beauties. The exhibits also include the treasures of local restaurant featuring local Tai Yai cuisine that is so very MHS because they can never be found any place else. 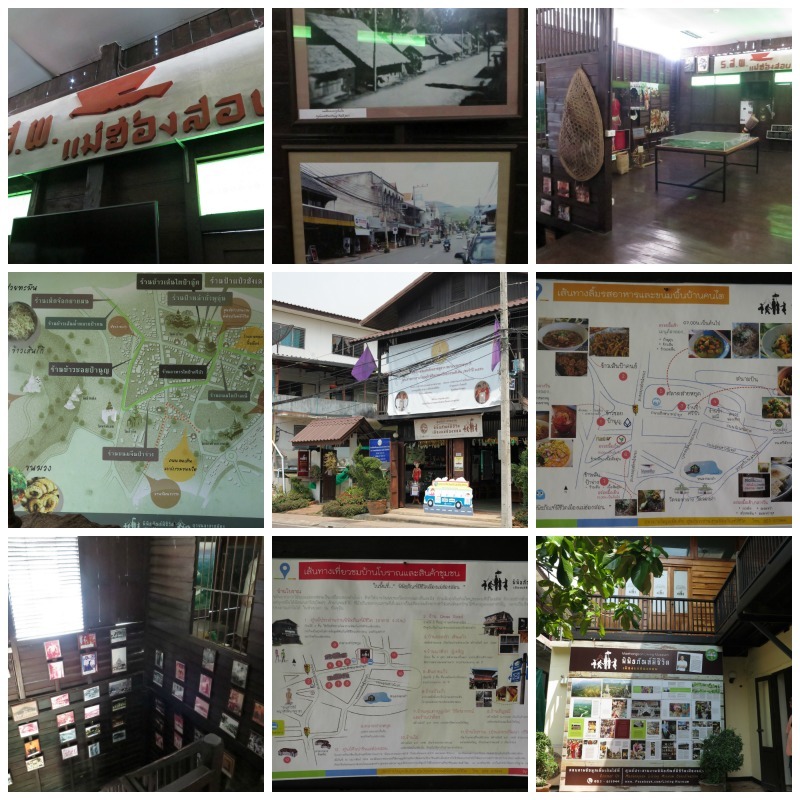 The museum, although without an official Facebook or website, do have some information about Mae Hong Son here. In Thai, though. This is perhaps Mae Hong Son’s most popular restaurant. 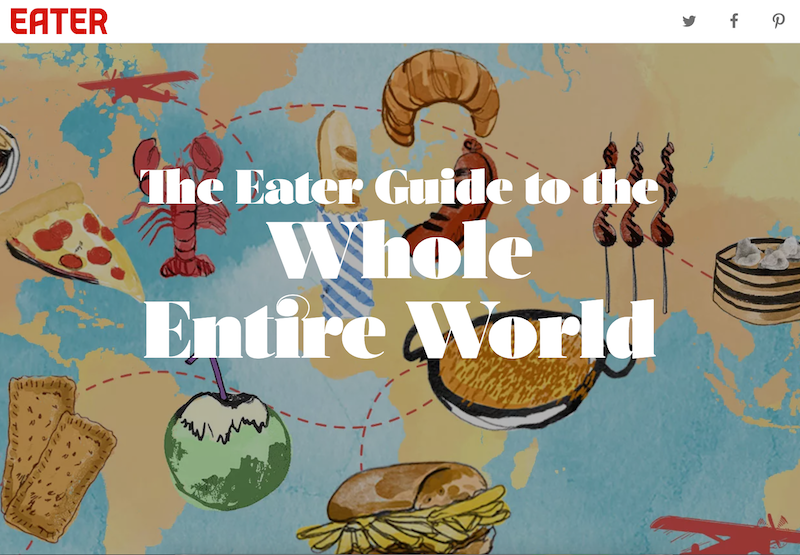 The big and expansive place serves mostly central Thai dishes with a bit of northern staples. But not so much of Mae Hong Son’s Tai cuisine. So, we tucked into a Thai fern salad (ยำผักกูด, bottom), a northern curry of Gaeng Kae Gai (แกงแคไก่, middle) and Gaeng Ho (แกงโฮะ, top). The food tasted good. Same owners as Fern Resort. 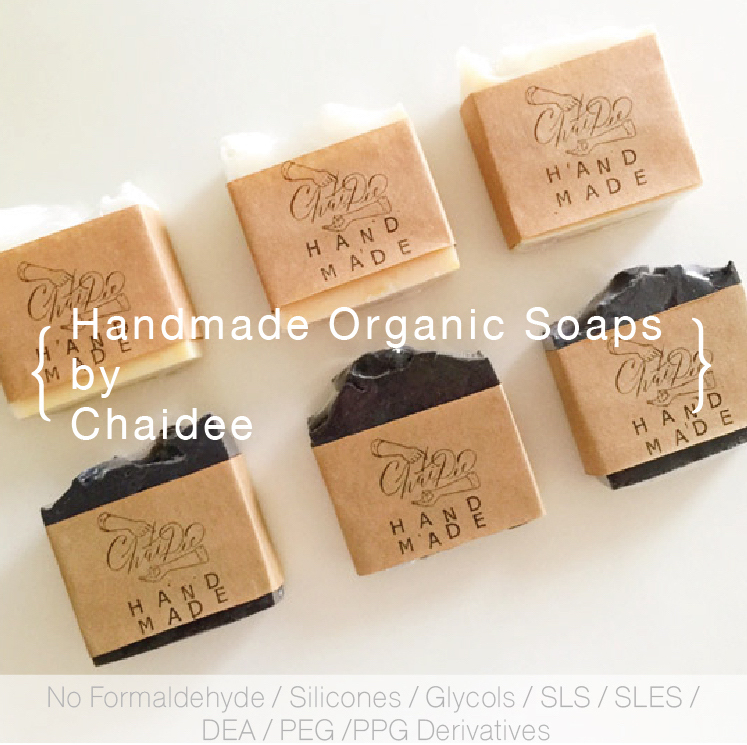 The prices are not net and will be plused with service charge. So called Talad Sai Yud (ตลาดสายหยุด), the market is right on the main road of ‘Singhanatbumrung’ (ถนนสิงหนาทบำรุง). The best time to go there is as early as you can. But not later than 9am. If you want to catch the town’s vibrant morning scenes, that is. Again, we were too late for the morning alms, but managed to observed that it is quite convenient to do so, for you can just buy some food from the market and stand by on the road when the monks walk by. 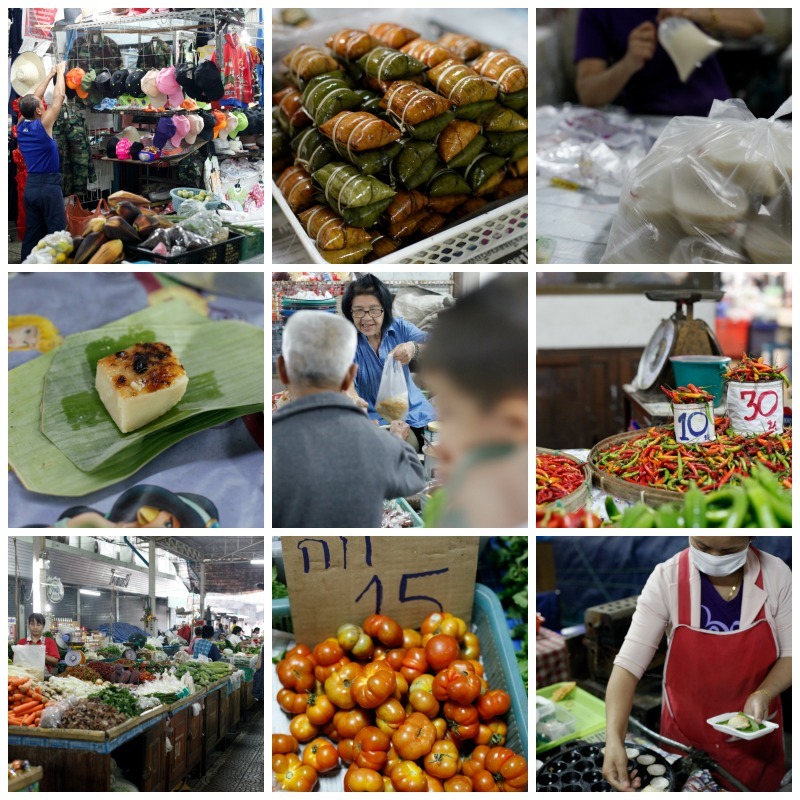 The fresh market is the excellent spot for Tai desserts, soy milk and Chinese doughs, and Tai breakfast that include Tau Oon (ถั่วอุ่น) – the noodle with thick chickpea sauce and deep-fried tofu sold by the rightest-hand stall, and Khao Sen (ข้าวเส้น) in pork+tomato soup or stir-fried (my fav) from the leftest-side stall. There are three vendors in the below image…so take note. These two stalls are located at the back of the market. If you come in from the main road, walk through the market to alley at the back where a lot of ready-to-eat food stalls are clustered. You won’t miss these two stalls for they are obviously the most popular. 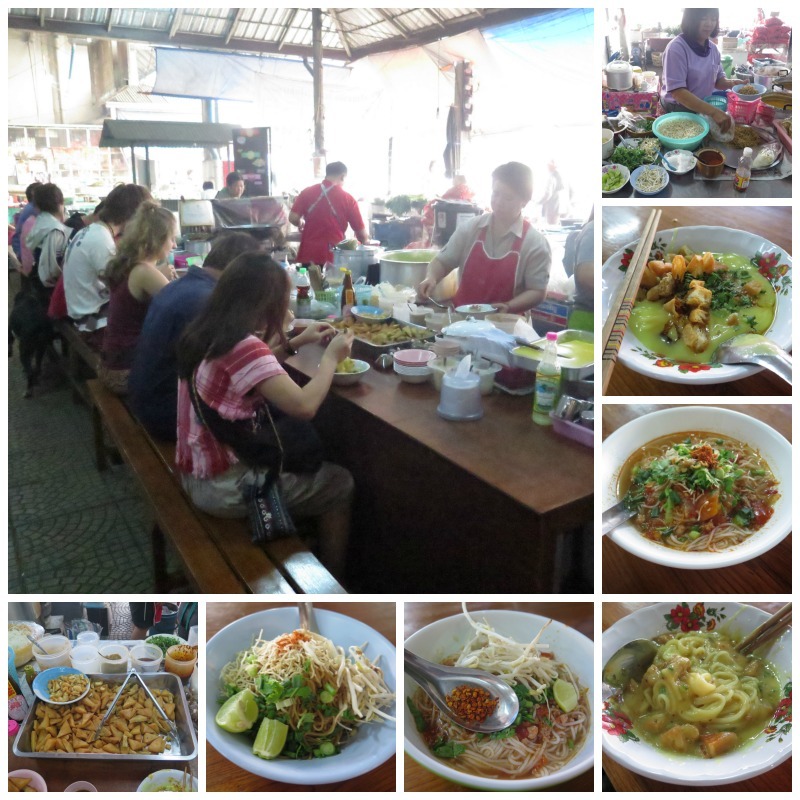 The Tai breakfast at Sai Yud Market in Mae Hong Son. The lady in purple blouse serves the best Khao Sen dishes (rice vermicelli) in either pork + tomato soup of Nam Ngiew (น้ำเงี้ยว) or stir-fried (the one with limes). The lady in the big middle picture sells Tua Onn (ถั่วอุ่น) which is thick rice noodle served in thick chick-pea soup and fried tofu. Really something worth getting up for. These stalls sell from 4am to around 10am. 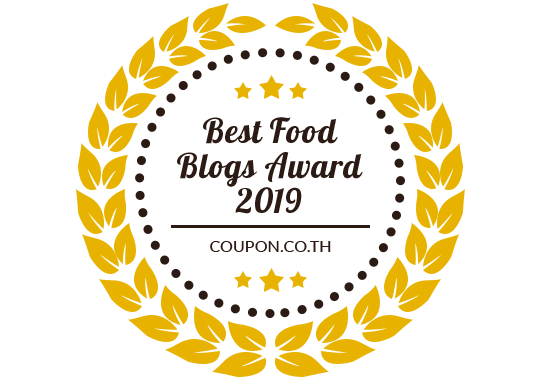 This is our favourite restaurant in Mae Hong Son, if you ask me. You can’t get any local than this. 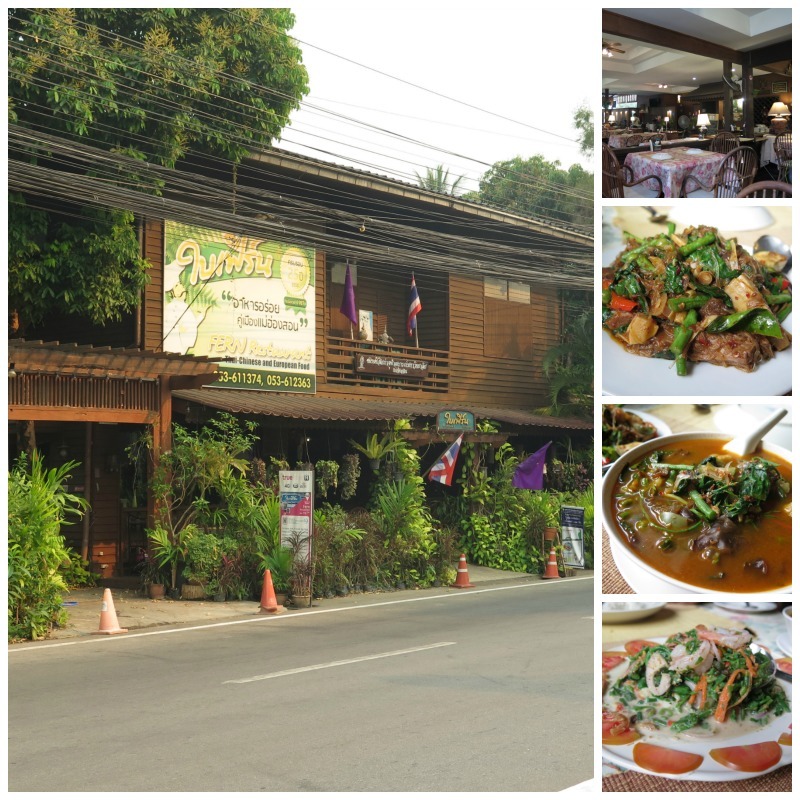 Pa Sri Bua is located on the main road (again, ‘Singhanatbumrung’ (ถนนสิงหนาทบำรุง)) towards the back. This place has been around for perhaps more than 40 years, selling the Tai cuisine staples with rice. 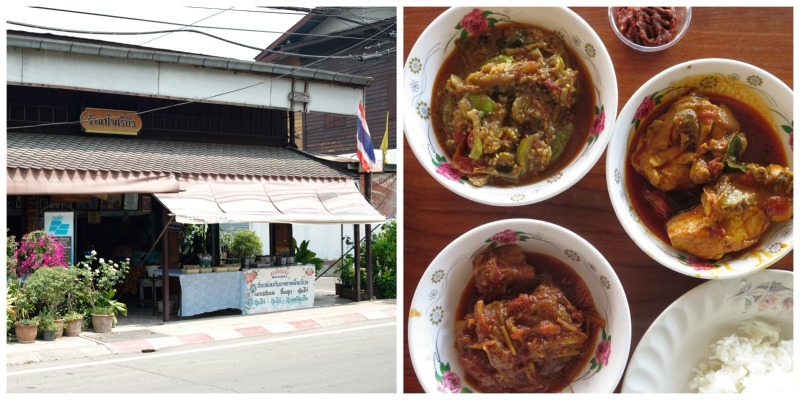 We so much enjoyed the three dishes here: the eggplant curry of Ma Kheur Ok (มะเขืออ๊อก), chicken curry or gaeng oop gai (แกงอุ๊บไก่) and hang-lae moo (แกงฮังเลหมู). We also had their nam prik ta daeng which was so spicy and delicious. Pa Sri Bua is open daily from 7.30am to about 3pm. If you be there early, and see the pots with lids on front, that’s the sign that the place is ready to serve. Coffee Morning is a place that visitors always check in when in Mae Hong Son. We were there, too. They advertise that they are using ‘environmental friendly’ coffees. We had a couple of usual things: iced coffee, latte (not a place for latte arts here, just tiers of milk and coffee) and some refrigerated desserts like brownies. I’d say the place is OK for coffees. But I’d skip the desserts, or bagel or anything that is not coffee. Also funny is that when we asked for more syrup in our iced coffee, we got them asking us back “not sweet enough?” Well, yes! Can we just have more syrup without having to explain anything to you? 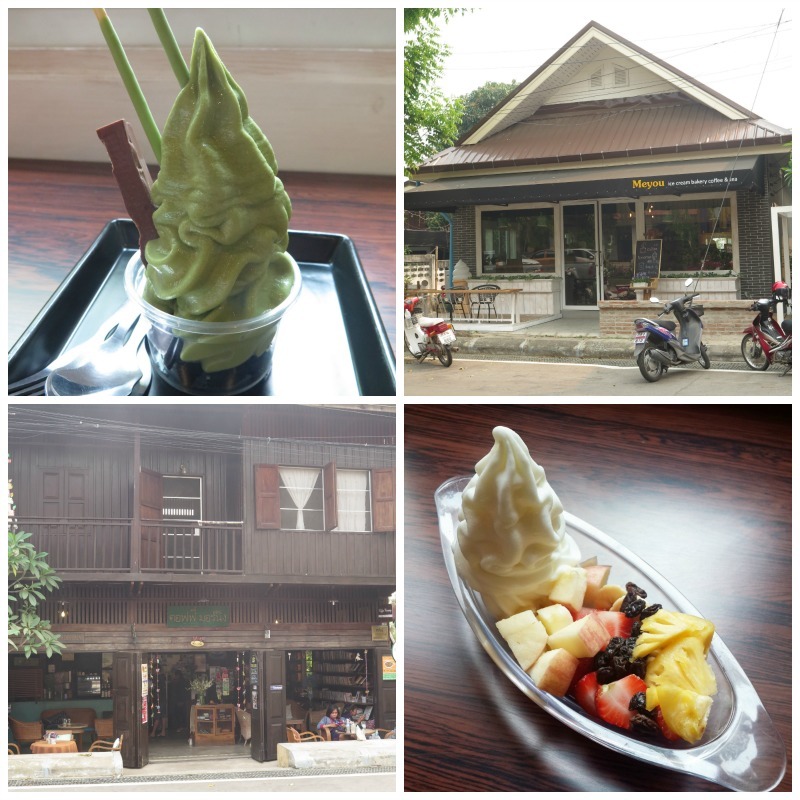 Next door to the cafe is this lovely loft-like Meyou ice cream and frozen yoghurt. I call this place the Pink Berry of Mae Hong Son. They serve good frozen yoghurt with assorted fruits. Also with air-con room. Nice place. I’ve heard a lot about Pang-Ung. 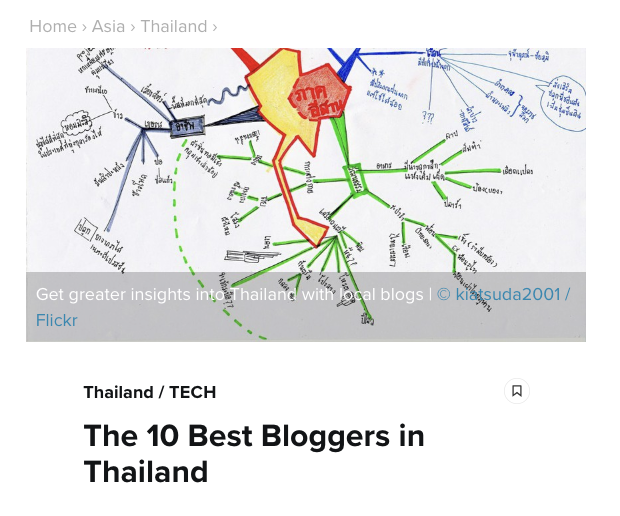 Gorgeous, Thailand’s Switzerland, tough place to go, always book in advance and all those things. Pang-Ung is basically a man-made dam with pine forest surrounding it. This is yet another royal project to retrieve and revive the once deforested areas of Thailand’s north. 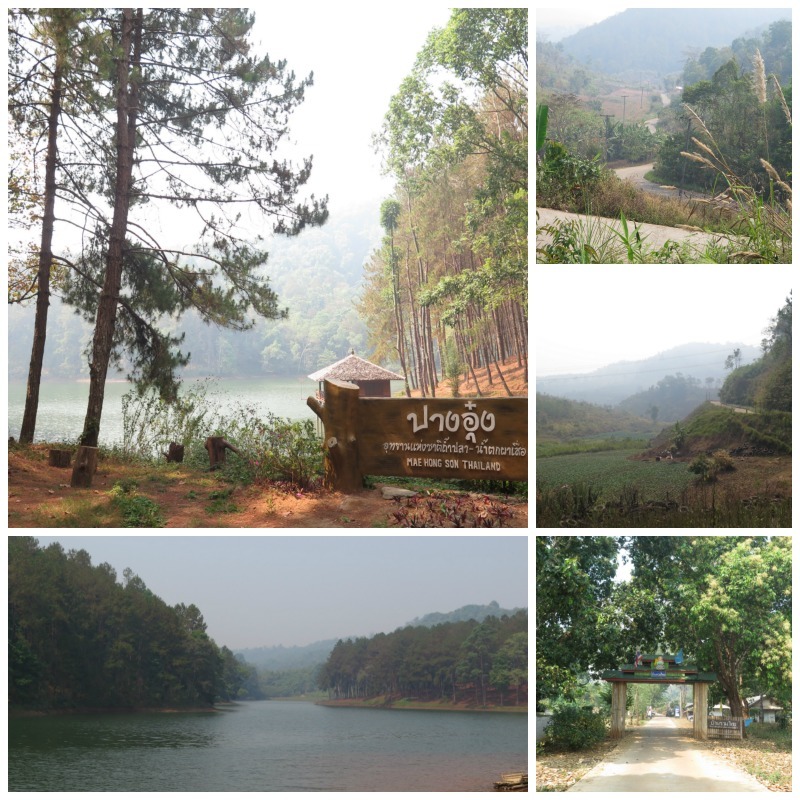 Pang-Ung is only 42 km from Mae Hong Son town but because of the terrain, it takes over an hour to get there. The road to Pang Ung is paved until the last 10 k.m. or so when it passes through villages and farms. Here, expect switch-backs in very narrow road. So, pay extra attention as always. If you have time on the way back, you can also stop by at Pang Tong Palace and Highland Development which is yet another royal project with missions to develop sound agricultural livelihood and occupations for the locals. With experimental farming and cattle breeding, the place is also a tourist spot. This is yet another very beautiful place. So serene. With giant bamboos lining up most corners. 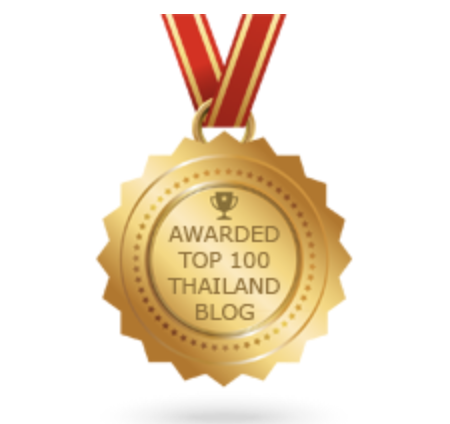 เรื่องและภาพมีการสงวนลิขสิทธิ์ | words and images are copyrighted.